With Mercedes claiming that the S-Class saloon is “the best car in the world” this new Mercedes S-Class Coupe has a lot to live up to. The latest generation saloon has been designed to take on limousines in China rather than exec saloons in European countries so the German marque has a space for a fast S-Class in their line-up. The Coupe S-Class joins the Mercedes-Benz GLA as the stars of Mercedes’s stand at the 2013 Frankfurt Motor Show. 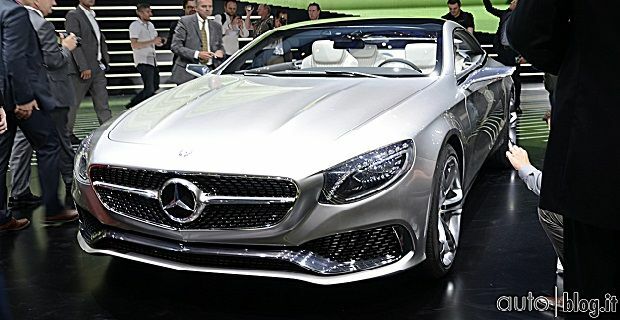 Although it’s just a concept vehicle, Mercedes is saying it provides “a concrete vision of the next model generation.” Visually this is a stunning machine with its long bonnet, E-Class style grille and tapered rear end making it look like a sleek muscle car rather than a saloon in a coupe shape. Frameless doors allow access to the cabin that comes with a 12.3 inch screen and an instrument cluster that has a “curved shape that is reminiscent of a whale fluke just before it re-enters the water.” The seats are sculptured to embody “sensual lines reminiscent of figurines in fashion design” and are lined with calfskin. The floor and roof lining are covered with silk, although the silk on the carpets has been reinforced to make it hard wearing. When this Coupe makes it to production a supercharged V8 and a V12 powered model will be offered but this concept model is powered by a naturally aspirated V8 that develops 449bhp and 516lb ft of torque. The Coupe’s equipped with an intelligent suspension setup that adapts to the changing conditions to maintain a set level of comfort is also included with the Mercedes S-Class Coupe. The S-Class Coupe is just one of many cars being shown at the 2013 Frankfurt Motor Show but it could well be the star of the event that goes on until 22nd September.